The Buntline hitch is a knot used for attaching a rope to an object. A secure and easily tied knot, it will jam when subjected to extreme loads. Given this propensity for jamming it is often made in a slipped form which is much easier to release by hand, albeit bulkier and less shipshape. 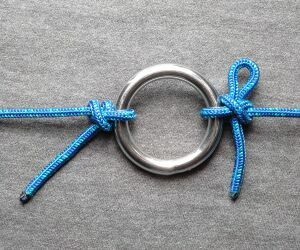 The Buntline hitch is formed by making a clove hitch around the standing part such that the second half-hitch is made on the side towards the object. Simple and effective, this hitch is likely very old. It dates back at least to the age of sail when it was the knot used on square-rigged ships to secure the buntlines to the foot of the sails. That the Buntline hitch was the preferred knot speaks to its security and reliability. Once set, repeated jerking and slatting tend to tighten it further rather than loosening it. Its compact size allowed the foot of the sail to be drawn up as closely as possible to the buntline deadeyes on top of the yard. It has gained in popularity in recent years due to its performance in slippery modern synthetic lines. The Buntline hitch is useful for attaching lines to rings, eyes, posts, rods, and railings where a compact and secure knot is required. 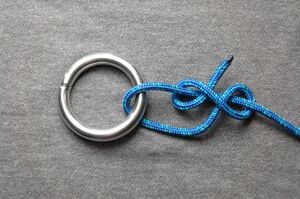 The non-slipped form is appropriate for moderate loads or where the knot will not need to be untied often. If heavily loaded it can be difficult or impossible to untie without the aid of a marlinspike. The slipped form is more versatile and convenient when a secure temporary hitch is needed. For example, the slipped Buntline hitch is an excellent choice to fasten a line to one side of a vehicle's luggage rack, with a trucker's hitch being used on the other side to tension the line over a load placed between them. The Buntline hitch is the same knot as the four-in-hand knot used for neckties. When it is made in flat material in the manner used to fasten a necktie, the working end is brought more parallel to the standing part during tightening than generally seen when made in cylindrical cordage for load-bearing purposes. The Buntline hitch is simply a clove hitch tied around the standing part, with the turns of the clove hitch progressing towards the object. The slipped variation is made by passing a bight through on the final step instead of the end. To release, pull the bight back through knot by tugging firmly on the free end. 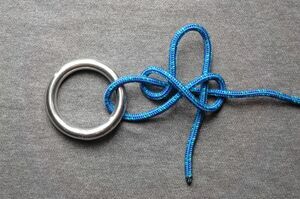 As noted in the sections above, the Buntline hitch is considered a very secure knot. The turns of the clove hitch must progress towards the object, otherwise the much less secure two half-hitches will result. Although not generally required, a round turn can first be made around the object causing the Buntline hitch to be even less prone to slipping. ↑ J.C. Turner and P. van de Griend (ed. ), The History and Science of Knots (Singapore: World Scientific, 1996), 28. ↑ 2.0 2.1 2.2 2.3 Brion Toss, Chapman's Nautical Guides: Knots (New York: Hearst Marine Books, 1990), 39. ↑ Clifford W. Ashley, The Ashley Book of Knots (New York: Doubleday, 1944), 310. ↑ Geoffrey Budworth, The Complete Book of Knots (London: Octopus, 1997), 51. ↑ 5.0 5.1 5.2 Des Pawson, Pocket Guide to Knots & Splices (Edison, NJ: Chartwell Books, Inc., 2002), 133. ↑ Brion Toss, The Complete Rigger's Apprentice (Camden: International Marine, 1998), 54. This page was last edited on 7 January 2014, at 21:19.